Components and plugins are relatively new features of web2py, and there is some disagreement between developers about what they are and what they should be. Most of the confusion stems from the different uses of these terms in other software projects and from the fact that developers are still working to finalize the specifications. However, plugin support is an important feature and we need to provide some definitions. These definitions are not meant to be final, just consistent with the programming patterns we want to discuss in this chapter. How can we build modular applications that minimize server load and maximize code reuse? How can we distribute pieces of code in a more or less plugin-and-play fashion? Components address the first issue; plugins address the second. A component is a functionally autonomous part of a web page. A component may be composed of modules, controllers and views, but there is no strict requirement other than, when embedded in a web page, it must be localized within an html tag (for example a DIV, a SPAN, or an IFRAME) and it must perform its task independently of the rest of the page. We are specifically interested in components that are loaded in the page and communicate with the component controller function via Ajax. An example of a component is a "comments component" that is contained into a DIV and shows users' comments and a post-new-comment form. When the form is submitted, it is sent to the server via Ajax, the list is updated, and the comment is stored server-side in the database. The DIV content is refreshed without reloading the rest of the page. Our goal is to be able to develop web applications by assembling components into page layouts. So far there is nothing special in this action, but we can turn it into a component by defining a new view with extension ".load" that does not extend the layout. (the actual generated code depends on the options passed to the LOAD function). The web2py_component(url,id) function is defined in "web2py_ajax.html" and it performs all the magic: it calls the url via Ajax and embeds the response into the DIV with corresponding id; it traps every form submission into the DIV and submits those forms via Ajax. The Ajax target is always the DIV itself. the first two arguments c and f are the controller and the function that we want to call respectively. args and vars are the arguments and variables that we want to pass to the function. The former is a list, the latter is a dictionary. extension is an optional extension. Notice that the extension can also be passed as part of the function as in f='index.load'. target is the id of the target DIV. If it is not specified a random target id is generated. ajax should be set to True if the DIV has to be filled via Ajax and to False if the DIV has to be filled before the current page is returned (thus avoiding the Ajax call). ajax_trap=True means that any form submission in the DIV must be captured and submitted via Ajax, and the response must be rendered inside the DIV. ajax_trap=False indicates that forms must be submitted normally, thus reloading the entire page. ajax_trap is ignored and assumed to be True if ajax=True. url, if specified, overrides the values of c, f, args, vars, and extension and loads the component at the url. 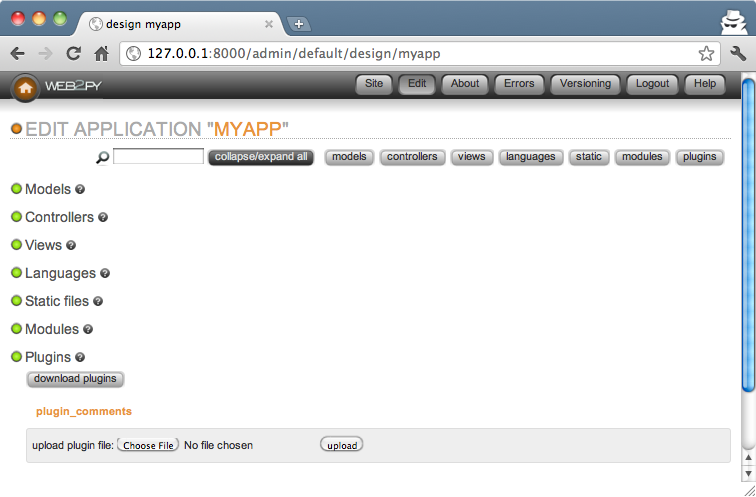 It is used to load as components pages served by other applications (which my or may not be created with web2py). user_signature defaults to False but, if you are logged in, it should be set to True. This will make sure the ajax callback is digitally signed. This is documented in chapter 4.
content is the content to be displayed while performing the ajax call. It can be a helper as in content=IMG(..). optional **attr (attributes) can be passed to the contained DIV. If no .load view is specified, there is a generic.load that renders the dictionary returned by the action without layout. It works best if the dictionary contains a single item. If you LOAD a component having the .load extension and the corresponding controller function redirects to another action (for example a login form), the .load extension propagates and the new url (the one to redirect too) is also loaded with a .load extension. *Please note:* Because Ajax post does not support multipart forms, i.e. file uploads, upload fields will not work with the LOAD component. You could be fooled into thinking it would work because upload fields will function normally if POST is done from the individual component's .load view. 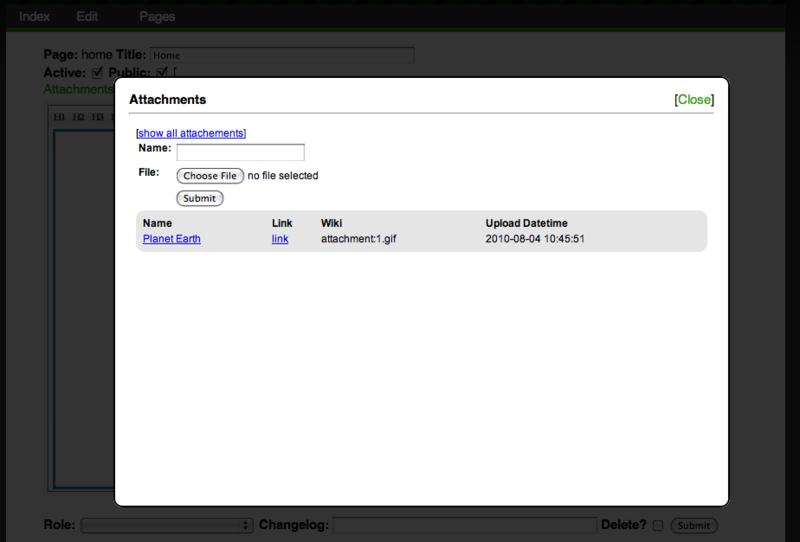 Instead, uploads are done with ajax-compatible 3rd-party widgets and web2py manual upload store commands. The former contains the URL of the page that called the component action. The latter contains the id of the DIV that will contain the response. form.errors.your_email = "Unable to send the email"
The first four lines define the form and accept it. The mail object used for sending is defined in the default scaffolding application. The last four lines implement all the component-specific logic by getting data from the HTTP request headers and setting the HTTP response headers. Notice that we did not define a .load view for our ask component. We do not have to because it returns a single object (form) and therefore the "generic.load" will do just fine. Remember that generic views are a development tool. In production you should copy "views/generic.load" into "views/contact/ask.load". If cid is specified, the linked page is loaded via Ajax. The cid is the id of the html element where to place the loaded page content. In this case we set it to request.cid, i.e. the id of the component that generates the link. The linked page can be and usually is an internal URL generated using the URL command. A plugin is any subset of the files of an application. A plugin is not a module, is not a model, it is not a controller, is not a view, yet it may contain modules, models, controllers and/or views. A plugin does not need to be functionally autonomous and it may depend on other plugins or specific user code. A plugin is not a plugins system and therefore has no concept of registration nor isolation, although we will give rules to try to achieve some isolation. 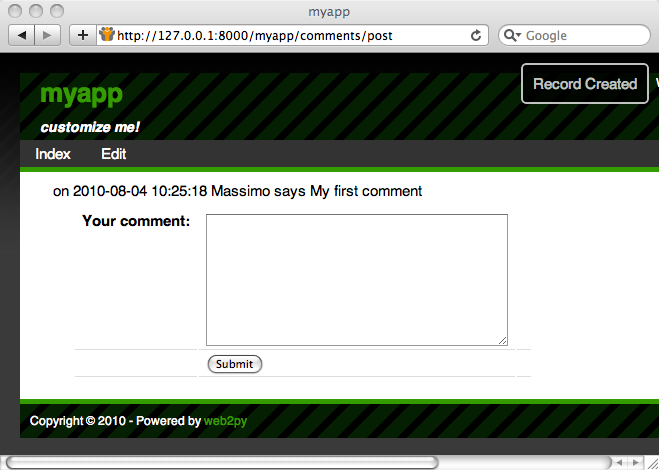 We are talking about a plugin for your app, not a plugin for web2py. So why is it called a plugin? Because it provides a mechanism for packing a subset of an app and unpacking it over another app (i.e. plug-in). Under this definition, any file in your app can be treated as a plugin. When the app is distributed, its plugins are packed and distributed with it. Yet as a matter of fact, by the definition above, these plugins are more general than those recognized as such by admin. Component Plugins. These are plugins that contain components as defined in the previous section. A component plugin can contain one or more components. 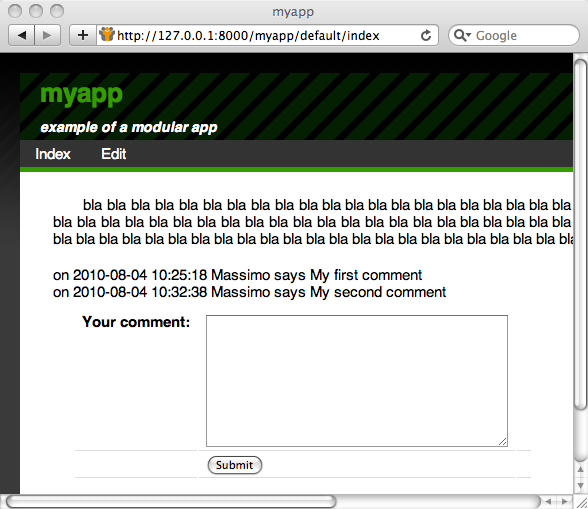 We can think for example of a plugin_comments that contains the comments component proposed above. Another example could be plugin_tagging that contains a tagging component and a tag-cloud component that share some database tables also defined by the plugin. Layout Plugins. These are plugins that contain a layout view and the static files required by such layout. When the plugin is applied it gives the app a new look and feel. If the plugin has model files, establish a convention so that the objects it defines do not pollute the namespace and do not conflict with each other. Rule 5: The plugin can only rely on the existence of the global objects defined in scaffolding "db.py", i.e. Some plugins may be more sophisticated and have a configuration parameter in case more than one db instance exists. Rule 6: If a plugin needs configuration parameters, these should be set via a PluginManager as described below. admin recognizes all the plugin_name files and folder as part of a single entity. plugins do not interfere with each other. The rules above do not solve the problem of plugin versions and dependencies. That is beyond our scope. Component plugins are plugins that define components. Components usually access the database and define with their own models. Here we turn the previous comments component into a comments_plugin by using the same code we wrote before, but following all of the previous rules. Second, we define a "controllers/plugin_comments.py"
Of course we can make the plugin more sophisticated by having components that take parameters and configuration options. The more complex the components, the more difficult it becomes to avoid name collisions. The Plugin Manager described below is designed to avoid this problem. The PluginManager is a class defined in gluon.tools. Before we explain how it works inside, we will explain how to use it. without having to edit the plugin code itself. Notice how all the code except the table definition is encapsulated in a single function. Also notice how the function creates an instance of a PluginManager. The plugins object is already instantiated in the default scaffolding app in "models/db.py"
The PluginManager object is a thread-level singleton Storage object of Storage objects. That means you can instantiate as many as you like within the same application but (whether they have the same name or not) they act as if there were a single PluginManager instance. You can configure multiple plugins in one place. When the plugin is defined, the PluginManager must take arguments: the plugin name and optional named arguments which are default parameters. However, when the plugins are configured, the PluginManager constructor must take no arguments. 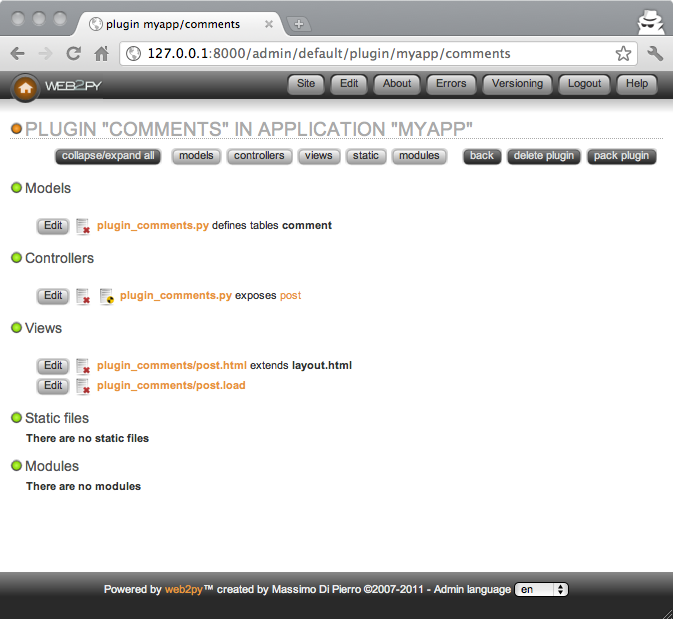 The configuration must precede the definition of the plugin (i.e. it must be in a model file that comes first alphabetically). First, create a folder called "static/plugin_layout_name/" (where name is the name of your layout) and place all your static files there. The benefit of this design is that users of this plugin can install multiple layouts and choose which one to apply simply by editing "views/layout.html". Moreover, "views/layout.html" will not be packed by admin together with the plugin, so there is no risk that the plugin will override the user's code in the previously installed layout. DISCLAIMER: plugin_wiki is still very much under development and therefore we do not promise backward compatibility to the same level as for web2py core functions. The idea behind plugin_wiki is that most applications include pages that are semi-static. These are pages that do not include complex custom logic. They contain structured text (think of a help page), images, audio, video, crud forms, or a set of standard components (comments, tags, charts, maps), etc. These pages may be public, require login or have other authorization restrictions. These pages may be linked by a menu or only be reachable via wizard form. plugin_wiki provides an easy way to add pages that fit in this category to your regular web2py applications. A wiki-like interface that allows to add pages to your app and reference them by a slug. These pages (which we will refer to as wiki pages) have versions and are stored in the database. Public and private pages (require login). If a page requires login, it may also require that the user have a particular group membership. Three levels: 1,2,3. At level 1, pages can only include text, images, audio and video. At level 2, pages can also include widgets (these are components as defined in the previous section that can be embedded in wiki pages). 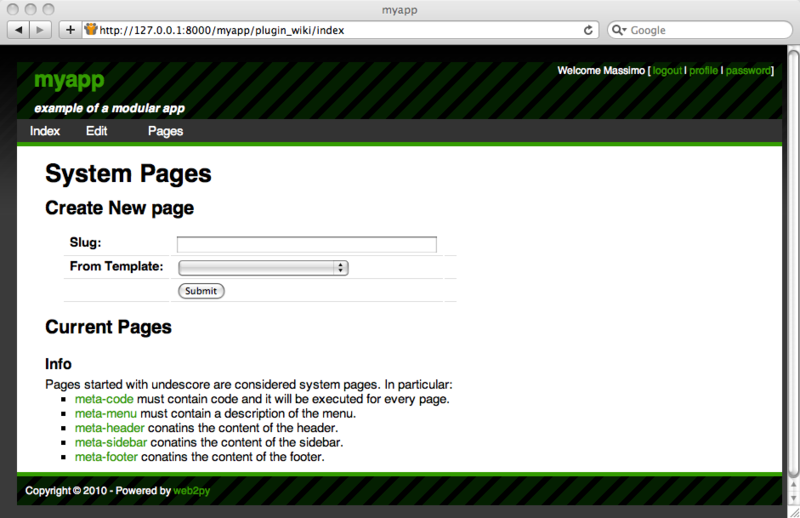 At level 3, pages can also include web2py template code. A choice of editing pages with the markmin syntax or in HTML using a WYSIWYG editor. A collection of widgets: implemented as components. They are self documenting and they can be embedded as regular components in normal web2py views or, using a simplified syntax, into wiki pages. The welcome app plus the plugin_wiki can be thought of as a development environment in itself that is suitable for building simple web applications such as a blog. From here on we will assume the plugin_wiki is applied to a copy of the welcome scaffolding app. The first thing you notice after installing the plugin is that it adds a new menu item called pages. Click on create page to edit its content. 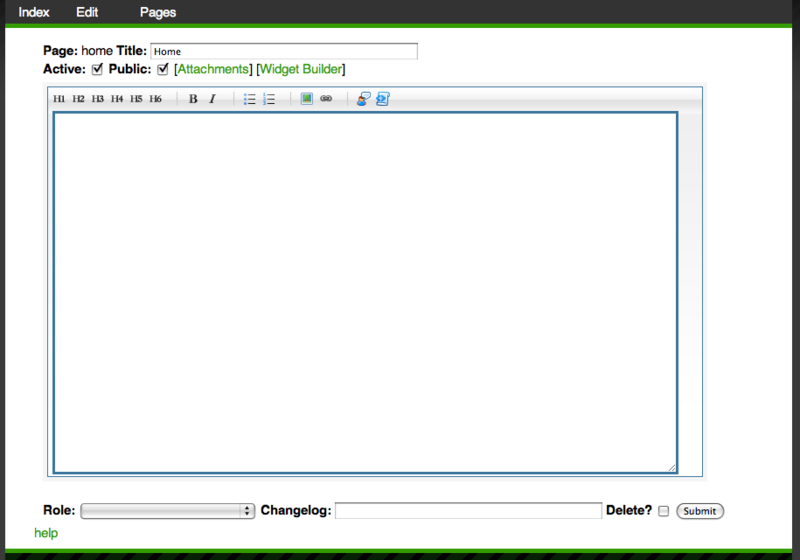 By default, the plugin is at level 3, which means you can insert widgets as well as code in pages. By default it uses the markmin syntax to describe the page content. 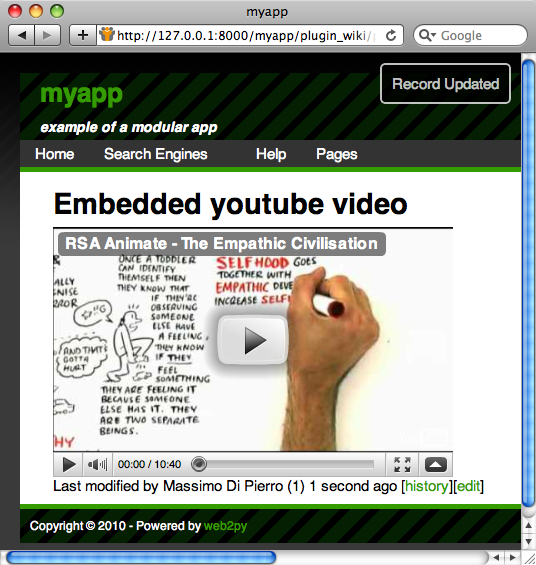 Notice that links, images, audio, and video files are embedded automatically. For more information on MARKMIN syntax, please refer to Chapter 5. If the page does not exist, you will be asked to create one. The size (200px) is optional. center is not optional but it may be replaced by left or right. 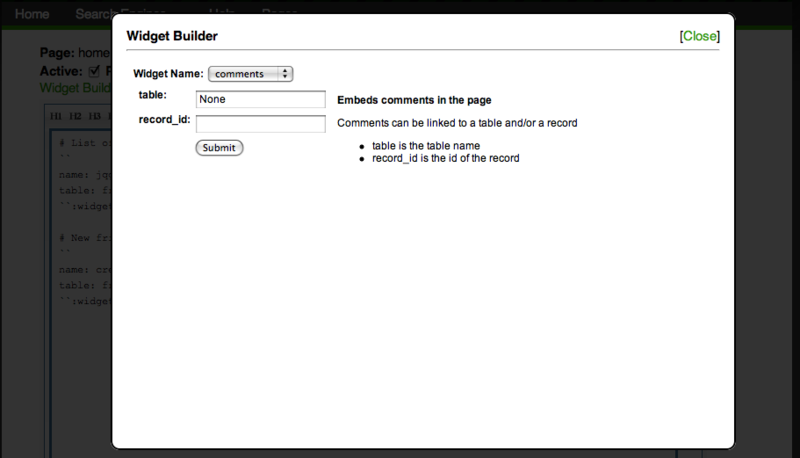 For verbatim text the class can be used to embed content of different types. (for a list of widgets see the next subsection). active (defaults to True). If a page is not active, it will not be accessible to visitors (even if public). public (defaults to True). If a page is public, it can be accessed by visitors without logging in. role (defaults to None). If a page has a role, the page can be accessed only by visitors who are logged in and are members of the group with the corresponding role. where the indentation determines the submenu structure. Each item is composed of the text of the menu item followed by a link. A link can be page:slug. A link None does not link to any page. Extra spaces are ignored. meta-code is another special page and it must contain web2py code. This is an extension of your models, and in fact you can put model code here. It is executed when "models/plugin_wiki.py" code is executed. You can define tables in meta-code. 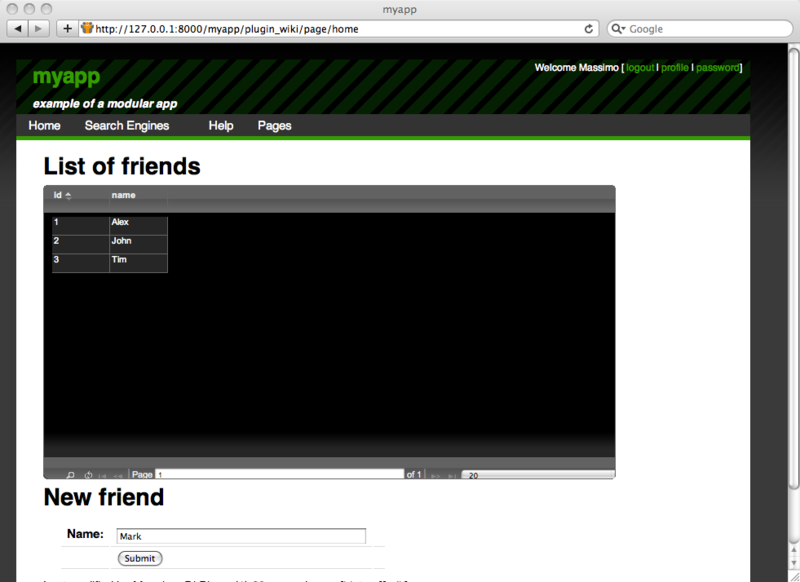 The page has two headers (starting with #): "List of friends" and "New friend". The page contains two widgets (under the corresponding headers): a jqgrid widget that lists friends and a crud create widget to add a new friend. In this way, the content of those pages will show up in the header, sidebar and footer in the layout. mode determines whether to use a "markmin" editor or a WYSIWYG "html" editor. theme is the name of the required jQuery UI Theme. By default only the color-neutral "ui-darkness" is installed. Each widget can be embedded both in plugin_wiki pages and in normal web2py templates. Widget arguments that do not have a default value are required. next is where to redirect, example "page/index/[id]"
Embeds a slideshow. It gets the images from a table. transition determines the type of transition, e.g. fade, etc. The table must have columns: latitude, longitude and map_popup. When clicking on a dot, the map_popup message will appear. return "body of the widget"
The first line states that you are extending the list of widgets. Inside the class, you can define as many functions as needed. Each static function is a new widget, except for functions that start with underscores. The function can take an arbitrary number of arguments which may or not have default values. The docstring of the function must document the function using the markmin syntax itself. When widgets are embedded into plugin_wiki pages, arguments will be passed to the widget as strings. This means the widget function must be able to accept strings for every argument and eventually convert them into the required representation. You can decide what the string representation must be - just make sure this is documented in the docstring. The widget can return a string of web2py helpers. In this latter case they will be serialized using .xml(). Notice how the new widget can access any variable declared in the global namespace. the visitor to ask a question. form.errors.your_email="Unable to send the email"
plugin_wiki widgets are not rendered by a view unless the response.render(...) function is called explicitly by the widget.